Intimidation Clothing is pleased to announce its sponsorship of Bellator MMA veteran William Penn in his upcoming heavyweight bout at the inaugural Driven MMA event on March 1 in Canton, Ohio. Penn (7-3) is set to take on fellow Team Intimidation member and former NAAFS heavyweight champ John Hawk (8-5) in one of the night’s most anticipated bouts. Intimidation has long been a supporter of Indiana’s Penn, who comes in riding a 4-fight winning streak. Although he has won his last 4 bouts, the Detroit native hasn’t competed since earning a first round TKO over Strikeforce veteran Jason Riley at NFC 7 in June 2012. Since then, his luck has been terrible as he has had multiple bouts cancelled. Penn also holds a knockout victory over UFC veteran Josh Hendricks, and his losses all came to notable opponents: current UFC star Stipe Miocic, former Sambo world champion Blagoi Ivanov, and tough veteran Raymond Lopez in his pro debut. Penn will be one of a host of fighters sporting the Intimidation brand during the Driven MMA event, including Kyle Rozewski, John Hawk, Maxim Grishin, Jessica Zomcik, Isaiah Chapman, George Comer, and Dustin Kempf. Intimidation will also serve as a title sponsor for the event and will be on hand selling its popular brand of t-shirts, hats, hoodies, fight shorts, and more. Intimidation Clothing is pleased to announce that sponsored Bellator MMA veteran Dan “Dragon” Spohn will return to action in the main event at UVC 24: Impact on July 27 in Columbus, Ohio. Spohn (8-3) will make his 3rd UVC appearance this year, as he bumps up to the heavyweight division for the first time as a pro to face fellow Bellator MMA veteran William “The King” Penn (7-3) in a massive bout. Spohn is a 4-time Bellator MMA veteran, Spohn has earned back-to-back submission victories since making his UVC debut earlier this year. He started his pro MMA career at 6-0 which included a 9-second knockout victory over Dane Bonnigson at Bellator 51; the second fastest KO in Bellator MMA history. Spohn is also the former NAAFS Light Heavyweight Champion having earned that belt by defeating John Hawk in 2012. Along with sponsoring Spohn and various other fighters, Intimidation Clothing will also serve as a title sponsor for the UVC 24 event and will be on hand selling its popular brand of t-shirts, hats, hoodies, fight shorts, and more. Intimidation Clothing is proud to announce their sponsorship of light heavyweight MMA fighter Ray Lopez in his title bout against Brendan Seguin this weekend at “TWC: Up Close and Personal” in Lansing, Michigan. Lopez sports a 7-3 professional record in his mixed martial arts career, including wins over Bellator vet William Penn, Strikeforce vet Marc Cofer, and UFC vet Chris Price. All seven of Lopez’s wins have come via stoppage, including five submissions and two knockouts. Lopez broke onto the national scene last year when he took on former UFC champion Andrei Arlovski, but he has also competed for King of the Cage and the Intimidation-sponsored UVC during his career. Lopez also went 3-0 during his amateur career, and he faces Seguin, a 40-fight veteran who made his MMA debut in 2000. The Intimidation brand was out in full force over the weekend sponsoring fighters in Minnesota, Ohio and West Virginia and had yet another great weekend. In addition to selling at Bellator 71 in Chester, West Virginia, at an event that featured several local fighters and the opening round of the Summer Series 2012 Light Heavyweight Tournament, Intimidation representatives were also on hand at NFC 7: Field of Fury in Carroll, Ohio talking to many of the top MMA related businesses from the Columbus/Central Ohio area. Once the dust settled the weekend proved to be a highly successful one with new sponsorships and additional dealers expected to come from the events. On Friday night at Bellator 71 the Intimidation brand had five fighters scheduled to be sponsored but after John Hawk’s fight was cancelled just four stepped into the Bellator cage. The big winner on the night was Josh “The Sandman” Stansbury who submitted Dan Spohn in the first round to win the NAAFS Light Heavyweight title in his Bellator debut. Now 4-2, Stansbury is riding high with four straight wins and some new hardware. On Saturday night at NFC 7 in Carroll, Ohio, the main event featured William “The King” Penn (pictured, right) in yet another impressive performance as he scored a TKO win over Jason Riley. While both men wore Intimidation’s premium quality EliteFighter board shorts, Penn, a Bellator veteran, won his 4th straight fight. He now has wins over a UFC veteran josh Hendricks in November 2011 for the NAAFS and a win over Strikeforce vet Riley this past weekend for the NFC. Also on Saturday the Intimidation brand sponsored Bellator veteran Nick Kirk for the first time. Coming off his first career pro loss at Bellator 67 in May, Kirk bounced back nicely scoring a TKO win at the 4:59 mark of round one. Kirk used improved boxing skills to defeat his opponent by TKO and improve to 8-1 as a pro. Another busy weekend is upcoming for Intimidation with the company’s first ever sponsorship of a RFO event in Mansfield, Ohio. In addition to selling at RFO: Mansfield Mayhem 12 the brand will be sponsoring several amateur fighters including Ryan Lose, Joe Callari and Dan Ramacciato from GriffonRawl MMA Academy, Brandon Poindexter from the Evolve Fight Team and Jake Anderson. Intimidation Clothing is a fast-growing brand of MMA apparel & gear based in Ohio with a strong presence throughout the Midwest USA and a growing national presence regularly being featured on multiple events on MTV2, EpixHD and SportsTime Ohio as well as MMA highlight shows on Spike TV and HDNet. In addition to over 50 styles of high-quality, bold t-shirts, the company is also becoming known for their premium-quality EliteFighter MMA board shorts, as well as vale tudo shorts, rashguards and more available online at IntimidationClothing.com. 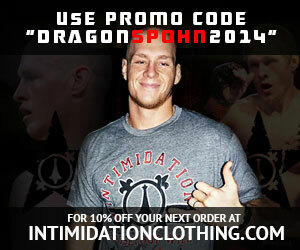 Fans can like Intimidation Clothing on Facebook and follow the Intimidation brand on Twitter. Intimidation Clothing is pleased to announce the sponsorship of Columbus based heavyweight Jason Riley at the June 23rd NFC 7 event. A 2-time Strikeforce veteran, Jason Riley (9-6) is a product of Buckeye MMA and will face off with another Midwest based heavyweight, Indiana’s William “The King” Penn (6-3). The event, NFC 7: Field of Fury will take place on June 23rd in Carroll, Ohio. Jason “The Juggernaut” Riley (9-6, 0-2 Strikeforce) has faced many high level heavyweights including former UFC Heavyweight Champion Tim Sylvia and Strikeforce Heavyweight Grand Prix winner Daniel Cormier. Riley will look to return to his winning ways after a 15 month layoff since fighting at Strikeforce: Feijao vs. Henderson in Columbus, Ohio in March 2011. Riley’s originally scheduled opponent, Mike Gordon (4-1), has been replaced by Indianapolis based heavyweight William “The King” Penn (6-3), a winner of 6 of his last 8 fights. Since losing his pro debut, Penn’s lone losses have come to UFC Heavyweight and rising star Stipe Miocic and Bellator Heavyweight Blagoi Ivanov. Most recently Penn defeated UFC veteran Josh Hendricks by KO in November 2011.